Hello, I’m Mike Riley, the developer, author, and synthesizer of the content of ‘The Dinosaur Fan’ website. 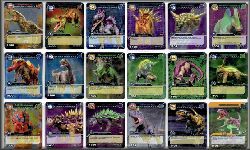 I originally embarked on this website project as an extension of my dinosaur card-collecting hobby. As time has gone by, my ‘free time’ energies have become split between non-sports collecting investigation and research pertaining to extinct life. I am hopeful that some of this material will be of interest to prehistoric animal enthusiasts as well as to non-sport card collectors. The following is a brief outline of my interests and background as well as some personal tidbits for those of you who are curious about what might have lead me to develop this website. Like many kids, I was a dinosaur-nut as a youth. I can recall many an hour playing with plastic dinosaurs, reading kids’ books about these animals, and even flipping through dinosaur flashcards. But over time, I lost interest as sports, baseball card collecting, and girls became more appealing. 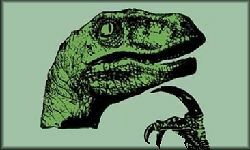 My current interest in dinosaurs was initially sparked in 1993 when I happened to attend one of Steven Spielberg’s movie gems entitled, “Jurassic Park”. Soon after watching the movie, I began reading non-fiction and fiction books involving prehistoric animals. Then in 1997, the movie “The Lost World: Jurassic Park” was released which further fueled my interest in dinosaurs. It was about that time that I was having a tough time finding dinosaur-related fiction books which I had not already read. So, I decided to write my own dinosaur fiction book which I tentatively titled, ‘The Cretaceous Continuum’. I’ve since ‘shelved’ this project due to the lack of free time to devote to the research I think is necessary to develop a science-based, somewhat believable storyline. However, the research I did complete, combined with my rekindled interest in dinosaurs, lead me to investigate Cryptozoology (e.g., the study of evidence supporting the potential survival of prehistoric animals into present day a. la. the Coelacanth), the casual study of extinct life, collecting prehistoric animal cards, and finally to the creation of this website. You will probably notice from my professional experience below that I do not have a background in paleontology, paleobotany, archaeology, geology or any other related field of study. While I have taken night courses in paleontology at the Denver Museum of Nature & Science, all scientific data contained in these pages was obtained from the on-line and printed sources listed in the Site Resources section of this website. BASEBALL CARD COLLECTING: One sunny afternoon in 1968 while watching a friend’s Little League team play, I wandered over to the concession stand behind home plate to purchase one of those sickeningly sweet blue bubblegum snow cones. As I reached up to place my money through the miniature sliding screen I spotted a box of baseball cards. Had my life been a movie, I might have heard a voice saying, “If you buy it, he will come”. The “he” was not Shoeless Joe Jackson or my dad but my childhood hero Willie Mays whose card magically appeared in the middle of the pack. And so began a 30-year baseball card collecting obsession which finally ended when a spreading “malignancy” in the form of investors and card grading companies completely infected the baseball card collecting hobby. Prices soared, vintage card availability shrank, and in the end, I joined the flow of collectors exiting the hobby; ultimately selling off my collection. DINOSAUR CARD COLLECTING: In late 1998, I was simultaneously mourning the end of my baseball card collecting days and pondering my growing interest in dinosaurs. It was during this time that my wife asked if I would occasionally place some bids for her on a relatively new on-line phenomena known as e-Bay. I was happy to help and did so for several months. An idea, something … something prehistoric had begun to twitch deep within my brain. And then one late night, it happened; instead of searching for my wife’s stuff, I typed just two words in the search box; “dinosaur cards” …. And so began my dinosaur card collecting hobby from which sprang the idea of creating ‘The Dinosaur Fan’ website. In 2013, after fifteen years, I finally ceased acquiring items for my personal collection although the ‘hunt’ has not entirely ended. I am still actively seeking information and images of collectibles which are not yet included in The Dinosaur Fan website and I began a secondary hobby focused on all things extinct. 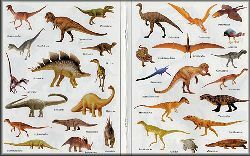 This ‘virtual collection’ of information and images pertaining to extinct life forms is the genesis of the Extinct Life Pictorial Encyclopedia which is now part of The Dinosaur Fan website. In addition to collecting and research, my hobbies include this website, viewing all manner of sporting events, watching action & science fiction movies, and reading fiction novels involving prehistoric animals, bizarre creatures, and/or mutant life on the rampage. I was an avid jogger which began during my first year in graduate school (i.e., 1980) and included countless 5K, 10K, 12K, and 21K races until 2004 when knee issues and inspiration from my second daughter lead me to take up figure skating at the ripe old age of 47. I’ve also played in countless softball, basketball, and bowling leagues though my playing days have long since ended. As a result of raising a beautiful child who happens to have intellectual disabilities and developmental delays, we have been involved in a variety of programs which support challenged individuals. My wife has devoted her life to helping people with special needs including the establishment and coaching of multiple Special Olympics gymnastics programs, coaching Special Olympics figure skating, and starting and/or participating in a variety of educational and recreational programs to benefit these individuals. In the summer of 2013, she established “Hearts ‘n’ Hands Work Enrichment”, a 501c3 non-profit organization with the goal of providing vocational training and business skills development in the community for people with intellectual and developmental disabilities with the intention of empowering them to live more independent, purposeful, and meaningful lives. I’d like to encourage anyone who happens to read this to visit the Hearts ‘n’ Hands Work Enrichment website (www.heartsnhandsco.org) and Facebook page (https://www.facebook.com/heartsnhandsco) to learn more about what this dedicated organization is doing to help adults with intellectual and developmental disabilities. I am currently a SharePoint developer and help desk consultant. Prior to that, I developed Microsoft SQL Server Reporting Services (ssrs) applications, Microsoft Access Services reporting tools, Microsoft Access database applications, front-end reporting tools, SQL application code, and EDI maps for a major player in the Telephony industry. And before that, I was a Computing Asset Manager and a Technical Writer for one of the major US Defense Contractors. I earned an MBA from the Peter F. Drucker and Masatoshi Ito Graduate School of Management at Claremont Graduate University in 1981, a BS in Management from the University of Redlands in 1979, and of course continue to attend technical skills development programs and classes whenever possible. I was born in Northern California on February 23, 1957. I’m married to a wonderful Godly woman, we have three lovely children, and two beautiful granddaughters.